There is no substitute for the turkey. If it's ruined, there's nothing but stuffing. If it's dry, you'll cry. If it takes two hours longer than you calculated, you'll be blowing up the AeroBeds. If the anxiety hasn't gotten to you yet, you must be the guy who invented that popup timer stuck in the bird. Don't hold your breath waiting for the Nobel Prize. The Mayflower Turkey. Judy supervises Andy doing the heavy lifting of the bird under full foil sail. Captured by a Nikon E900 at f2.4 and 1/30 second. The trouble with turkey (and whole chickens for that matter) is that the dark meat cooks more slowly than the white meat. So it's a little like you have to burn out the highlights to get shadow detail or lose the shadows to keep the highlights. Various strategies have been deployed to address this issue, as we found out one year. Four family members drove up to San Francisco from Los Angeles and three more arrived from Rochester. Everyone got in by Tuesday night and we hit the sack around 2:30 a.m. After work on Wednesday, we had pizza then we piled into three cars at 8 p.m. and, with walkie talkies to keep in touch, caravaned in the dark to the Valley of the Moon in the wine country where we had a place at the time. Someone, fortunately, remembered to bring along the bird, so it was there on Thursday morning waiting for instructions. It was at that point we realized none of us knew how to cook one of the things. A wonderful bird with three kinds of wine and salad and Brussels sprouts and mashed potatoes and candied sweet potatoes and stuffing. So much we forget the two kinds of cranberry sauce Judy made (a tradition to forget them in her house, she says). Three kinds of pies. Whipped cream. And we never get to the port and Stilton. The 1998 image, helped by the built-in flash, is from Nikon's first digicam, which captured images as large as 1280 x 960 pixels. We'd confess the ISO setting but the Exif header didn't bother to record it. Those were the days. It survives as a snapshot but we opened it in Photoshop CC 2014 and ran the JPEG through the Camera Raw filter to get what you see here. 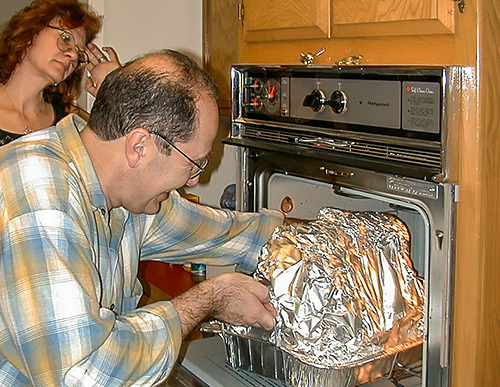 Modern software can't work miracles but it can sure cook a turkey. We have a lot of fond memories of that Thanksgiving in 1998. And we expect to make some today too. Here's hoping, with glasses raised, you do too.